Can anything go wrong when chicken meets a spicy, yogurt-based marinade on a weeknight? The answer, as we recently found out, is no. Our user Fatima sameena sharif uploaded her favorite recipe for Chicken Malai Boti and stole the hearts of the Kitchen Stories team. “Malai” means cream and “Boti” means chicken–hinting at what you can expect from this simple Pakistani dish. If you’re bored of your regular old chicken recipes, this dish will knock you out of that rut and serve to impress not only yourself but your family and friends, too. When we tested this recipe, the team actually fought over the last few pieces! It’s just like Fatima says, the meat practically melts in your mouth. The recipe is easy and comes together quickly, even if you want to cook in big batches for groups. Prepare the marinade in the morning or even the night before and let your chicken marinate until its time to cook. It doesn’t get simpler than that. Using boneless, skinless chicken breasts will give you the best outcome, and the easiest way to finish it off is to thread it onto skewers and cook it on a grill over an open flame. If that’s not possible, you can cook them in a grill pan or leave them off the skewers completely and fry them in a wok or frying pan. A creamy base: This is a yogurt-based marinade with just an added bit of cream. The lactic acid in yogurt-based marinades help tenderize meat, giving it a soft texture and tangy flavor that’s popular in Middle Eastern and Indian dishes like this one. Make sure to blanch the almonds until they’re soft, so they can give some nutty depth and an additional silky texture to the marinade. The perfect combination of spices: Garlic and ginger are a classic combination but adding other aromatic spices and herbs like cilantro, Garam Masala, cumin, and chili give the chicken even more flavor. Feel free to experiment with the recipe by adding other fresh herbs and spices you might have on hand. Even the best dish needs a partner on the plate, to give it a finishing touch. Traditionally Chicken Malai Boti would be served with a fresh yogurt dip like raita, a simple salad, and some warm flatbread. 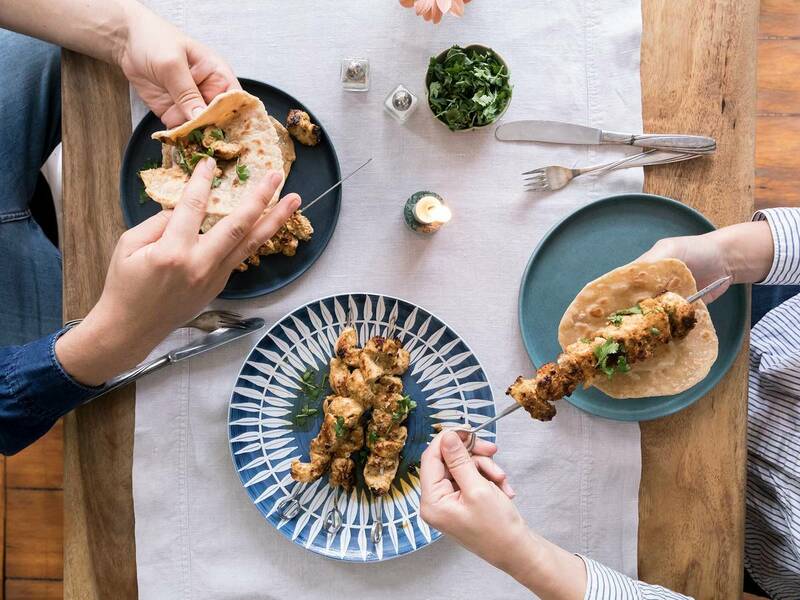 Community member Fatima prefers to roll it in some paratha and dip it in chutney or ketchup, but you can try it with chapati, roti, homemade naan, and other yogurt dips as well.